Marvel Comics extended its lead over #2 comic store publisher DC Entertainment in 2018, with a 38.24% share of comics and graphic novel sales in comic stores, compared to 30.04% share for DC according to information released by Diamond Comic Distributors today. That 8.2% share lead was up from the 6.29% share lead Marvel held last year (see "Marvel Takes 2017 Market Share Crown in Comic Stores"). The change was in Marvel, which had an increase in share; DC’s share was essential flat (down .03%). 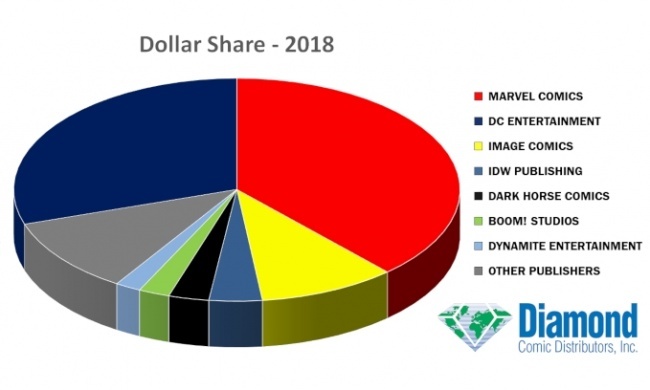 And as we often see in periods of relative weakness in the comics market, the combined share of the Big Two grew to 68.28% of the total market, up from 66.43% last year. Comic store market shares of three of the next eight publishers were up slightly (Image Comics, BOOM! Studios, and VIZ Media), and shares of the other five were down slightly (IDW Publishing, Dark Horse Comics, Dynamite Entertainment, Titan Comics, Oni Press). 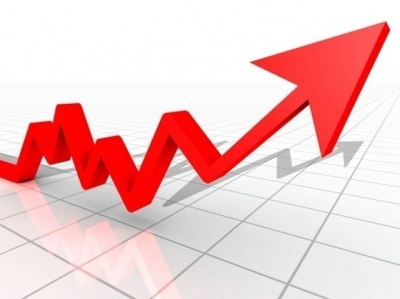 Sales of comics and graphic novels to the channel were down 1.08% for the year, Diamond said, with a 2.04% increase in comic sales not able to offset an 8.22% drop in graphic novel sales. [Note: These numbers were corrected by Diamond from a small increase to a small decline on January 18, see "Direct Market Comics and Graphic Novel Sales Down 1% in 2018."] The 2018 numbers are a big comeback from 2017, when overall sales were down 10.09%, with comic sales down 10.40% and graphic novel sales down 9.38% (see “DC Wins In Another Weak Month”). 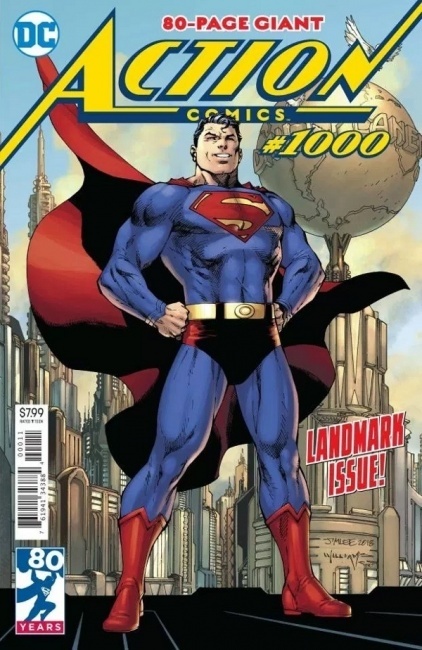 DC Comics' Action Comics #1000, the relaunch scripted by Brian Michael Bendis in the first major release from his new publisher, was the top comic in the Direct Market in 2018. The ascension of a Superman title to the top of the comic store charts dethrones Batman as the king of comic store characters, at least up top. Eight of the top 10 comics in comic stores in 2018 were up-price products, illustrating the growing Big Two trend of pricing key books at premium prices. Marvel Comics' Infinity Gauntlet, a 1991 title by Jim Starlin, George Perez, and Ron Lim was the top graphic novel in comic stores, driven by the release of Avengers: Infinity War, which drew upon the storyline as part of it source material. Although it's a great measure of the value of the stories in the overall comics archive and the quality of the work there, it's not a positive sign for the current creative environment that no publisher could release new material that sold better than 27-year-old stories in 2018. 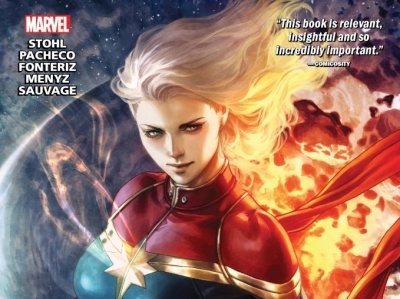 For links to all previous Top 300/500 Comic and Top 300/500 Graphic Novel articles, see "ICv2 Top 300 Comics and Top 300 GNs Index."